KAMLOOPS, B.C. 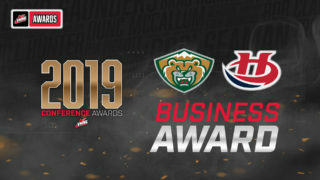 – Noah Juulsen delivered a game winning goal 46 seconds to help the Everett Silvertips finish a come-from-behind 4-3 victory in sudden death overtime over the Kamloops Blazers before 3,656 fans at Sandman Centre on Saturday. Juulsen’s goal, breaking a seven-game scoring drought, led the Silvertips out of a 3-1 deficit in the third period for their sixth win in the last seven road games, additionally extending their lead to three points over Seattle and Spokane for first place in the U.S. Division. Mario Petit earned his first career WHL victory in net with 14 stops. The Silvertips earned their ninth straight victory over Kamloops, 9-0-0-0 in the series since head coach Kevin Constantine’s return in 2013-14. Collin Shirley, Kamloops’ leading scorer, built a 1- 0 lead on a backhanded tuck just 1:52 into the game after the Silvertips gave the puck away in their own zone. Brandon Ralph responded with his second goal of the season for a 1-1 tie at 17:19 of the first period when he converted Lucas Skrumeda’s rebound at the base of the right circle. Devon Sideroff’s power play goal at 16:46 restored the Kamloops lead to 2-1 in the second period on a power play, when he fired a wrister through traffic for his 10th goal of the season. Matt Revel then pushed the Silvertips into a deeper hole, 3-1 at 5:28 into the third period when he slammed a snap shot off the post from the left circle. Winless in nine previous tries when trailing in the third period, the Silvertips responded to the challenge with Matt Fonteyne’s power play goal at 7:38, a rebound at the right post after goaltender Connor Ingram got a pad on Graham Millar’s backhander. Ingram kept the Silvertips at bay momentarily, delivering a point-blank save on Patrick Bajkov’s half-open net bid from the left circle. But Carson Stadnyk notched his ninth goal of the season, tying the game with 7:11 left in the third period. He took Dawson Leedahl’s chip pass and raced around rookie defenseman Luke Zazula. Stadnyk, at top speed, finessed a wrister past Ingram. 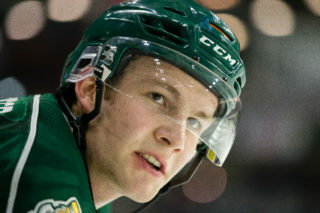 After the Silvertips negated Kamloops’ lone zone entry to begin overtime, Fonteyne connected on a pass to Juulsen’s tape. 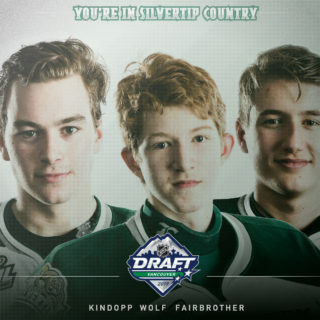 He took a Kamloops defender to the net and muscled a forehand bid through Ingram’s five hole, igniting the Silvertips bench which spilled onto the ice to celebrate. Ingram made 34 stops in the loss. 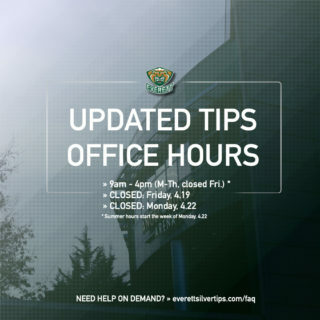 NOTES: The Silvertips scratched Tristen Pfeifer, Jaeger White, Montana Onyebuchi, Mackenzie Dwyer and Yan Khomenko … Stadnyk has 11 points in the last 10 games … Everett outshot Kamloops, 38-17 and 18-3 in the third period … they have converted three power play goals in the last two games … playing in a stretch of 10 road games out of 12 overall, the Silvertips improved to 7-2-0-0 in that stretch. 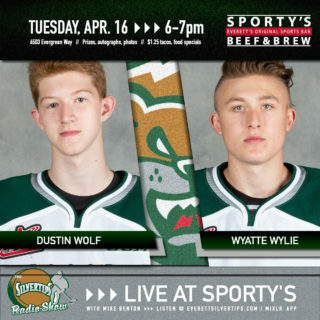 The Silvertips enter a five-day layoff and return to play on the road, Friday to visit the Kelowna Rockets at 7:05 p.m. (1380 AM/WHL Live) at Prospera Place.